Emma A. Zierke (1871-1960), was the younger sister of my great-great-grandmother Ottelia Zierke. Like all the Zierke children, Emma was born on the Zierke family farm in Harris, Wisconsin. She was the second of five surviving children of Anna Wilhelmine Schulz and Friedrich Zierke Jr. I was lucky enough recently to get in touch with Emma’s great-grandson Tim Dittmer, and all the photos listed below are courtesy of him. Emma Zierke as a younger woman. Emma married Albert William Barwineck (an immigrant from Pommern, Prussia) in 1893, and they had four children that I know of: Walter, Ella, Albert, and Flora. The Barwinecks lived in Wood County, Wisconsin for a while before moving to Schofield and Wausau. While they were in Schofield, Albert worked at the Marathon Paper Mills where my great-grandfather Edwin Schmidt also worked. Later the Barwineck family moved to Milwaukee, and finally to Marshfield where Emma died in 1960. 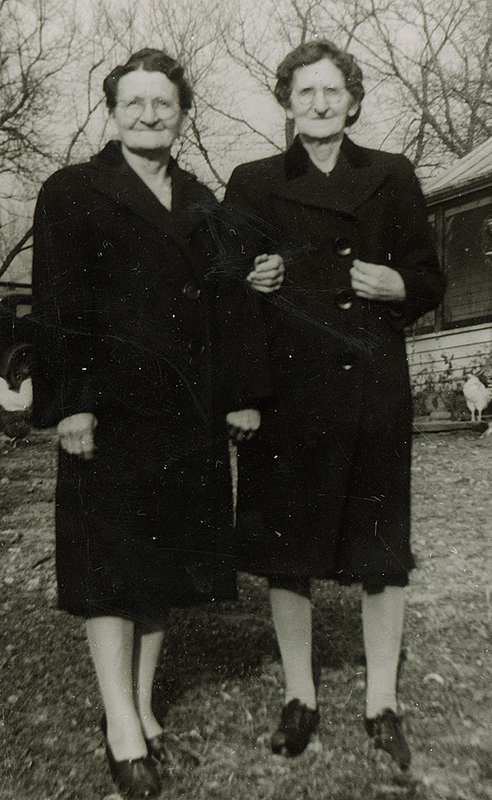 This photo shows Emma as an older woman with her grand-daughter Jacquelene Barwineck. It was taken about 1944. 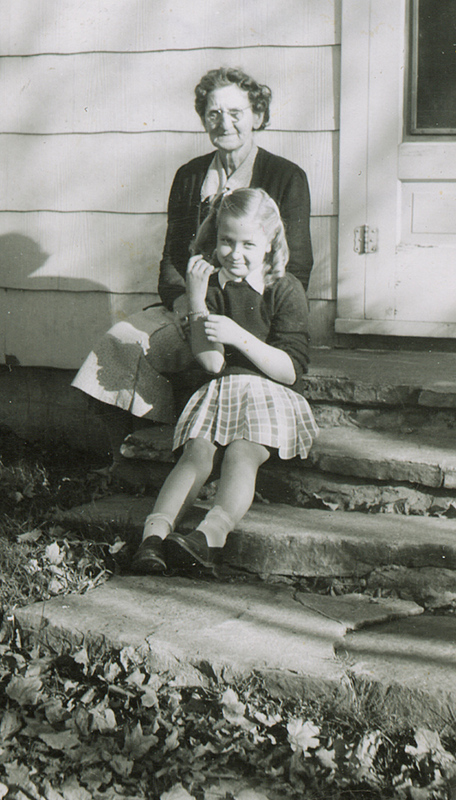 This one shows Emma with her grandchildren Gerald and Jacquelene Barwineck, taken about 1950. I didn’t expect to get photos of Emma’s sister (another of my great-great-grand-aunts), Minna Pauline Zierke (1885 – 1970). But there are two photos of Emma and Minna together. You can definitely tell they are sisters. 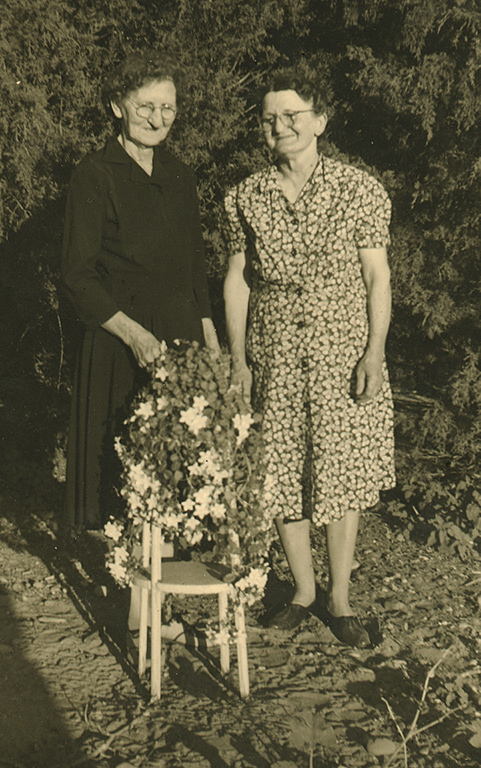 The other photo of the two sisters. At first I thought it was some kind of funeral floral arrangement in front of them, but looking closer I think it’s just a flowering plant in a wooden plant stand. Finally, a real treat, also sent to me by Tim. 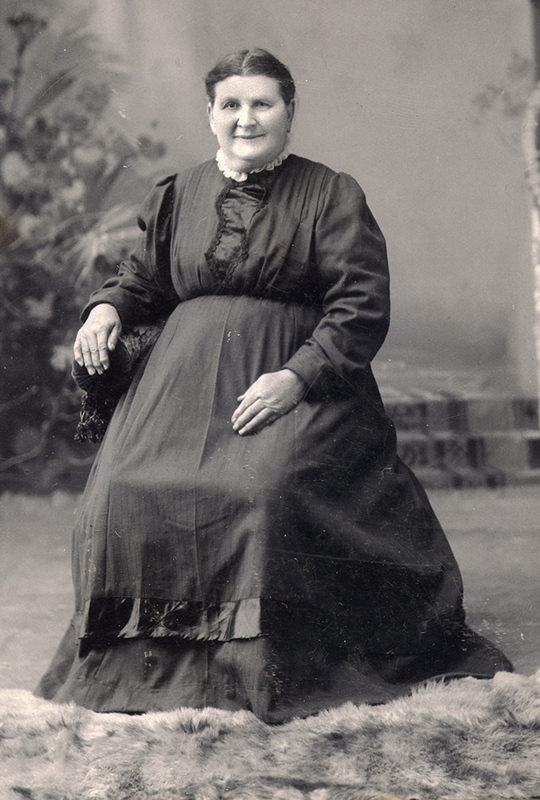 This is a photo of my 3x great-grandmother Wilhelmine Schulz. I have written about her family on this blog many times. She was born in Podstolitz, Kreis Kolmar, Posen, Prussia and came to the US in 1866. I had this photo previously, except it was just her face. This is the full photo, and you can see her in her entirety, which I love. I especially like the fur rug at her feet. So random! Anna Wilhelmine “Minnie” Schulz, c1915. It makes me realize that somewhere is a matching photo of her husband Fred Zierke, from which the hand-tinted portraits that Gary Zierke owns were made. Hopefully I can find it someday. Sometimes it’s better to be lucky than good. My apologies for the exposition explaining how I found this record, but it was a pretty thrilling ride, so I wanted to make note of it. Recently I’ve been spending many long nights going through parish records of Kreis [county] Naugard in Pommern [Pomerania], Prussia, page-by-page, looking for my Kamrath family. I have found a lot of Kamrath records, but not my specific family. After checking about 80% of the available parishes, I was beginning to get disheartened. Then a fairly random event sparked my interest in checking the parish books for nearby Kreis Regenwalde. Regenwalde is the town where my grandfather was convinced his Krueger family came from. As I’ve said before, I have no idea why he thought they were from Regenwalde, because all the evidence I’ve found points more to the northwest for the Krueger family, in Kreis Cammin. Nevertheless, it seemed like a manageable task to “spot-check” the Regenwalde parish books. What I do is pick the birth-date of a family member I know (in this case Heinrich Krueger who was born 31 Dec 1857), and check the parish records for that birth. If it’s not there, I look around and note if the family name is found at all. If it is, I make note of that. Repeat for each book. So I was going through the “church book” (kirchenbuch, in German) looking for the birth record of Heinrich Krueger. I started in 1856 just to get the lay of the land and see what families were in that town. I did see some Krueger (Krüger) records, which was promising. Then, on page 523, in the marriages for 1857, I saw a familiar name: Kamrath. Marriage Record, 1857, Plathe, Kreis Regenwalde, Pommern, Prussia. It struck me as odd, because I had not seen any other Kamrath records in the book at all. The groom’s name was Carl Friedrich Ferdinand Kamrath. 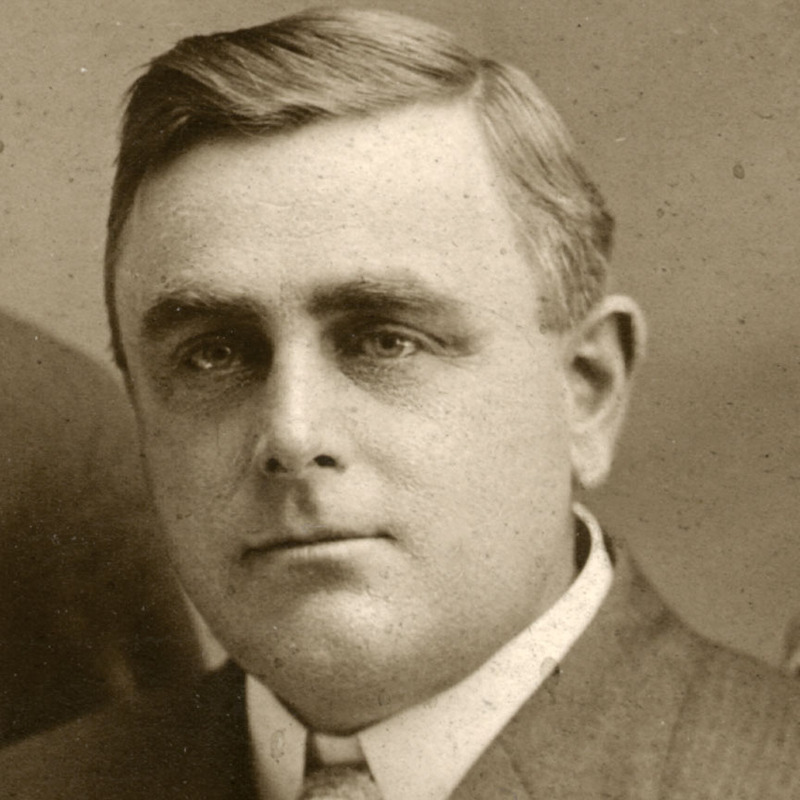 “Carl Kamrath was the name of my great-great-grandmother’s father!”, I thought. I took a closer look. The groom’s age was given as 26 years. That meant this Carl Kamrath was born in 1831. I flipped to Ancestry to check my 3x great-grandfather’s birth date. 6 March… 1831. A match. This marriage was in 1857. When was the first child of my Kamrath family born? I checked the date. Auguste Kamrath was born in 1858. Wow. Ok. Another match. Carl Kamrath’s first wife’s name was listed on the marriage record of Heinrich Krueger and Bertha Kamrath as “Henriette Prinow”. The bride’s name on this record was listed as “Wilhelmine Henriette Sophie Prilbernow”. There was Henriette, and Prilbernow versus Prinow? That makes sense too. I’ve never seen a single record in the tens of thousands of Prussian records I’ve checked that was “Prinow”. I had a theory that the name might have actually been Pinnow, which is a name that you see occasionally. But Prilbernow. That’s a tough name and I could see how someone might have written it down incorrectly. I looked closer and noted that Henriette’s father’s name was given. Erdman Friedrich Pilbernow, a tagelöhner [day-laborer] from the town of Meesow. The name of the town rang a bell. I checked my map. On the passenger sheet for the Kamrath family coming to America they listed their town of residence as “Roggow, Pommern”. The problem was that there are three different Roggow’s in Pomerania. I didn’t know which was theirs. 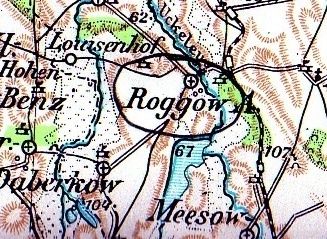 But then I checked the map for Meesow and saw it was only about 2.5 miles from Roggow. I knew I had a hit. That was five pieces of matching information in this single record, which is pretty convincing. It seems to me that the couple were married in Plathe in 1857, and then ended up outside Roggow by 1885, near Henriette’s home town. This is what happened to my Schmidt family also. There is still a lot of work to do. There should be birth records for their children and a death record for Henriette around 1864. Carl Kamrath married his second wife Henriette Sense around that time. But this is a very exciting development for me and my family. I am feeling confident that we finally know where our Kamrath family came from! Carl Friedrich Ferdinand Kamrath, “Stellmacher” [cartwright or wagon-maker], age 26 [b 1831], from “Vorwerk Plathe” [A Vorwerk is a homestead outside a town, so basically this means he lived on the outskirts of Plathe.] married Wilhelmine Henriette Sophie Prilbernow, age 23 [b 1834]. Her father was Erdmann Friedrich Prilbernow, a tagelöhner [day-laborer] from Meesow. The marriage took place on 20 Mar 1857. 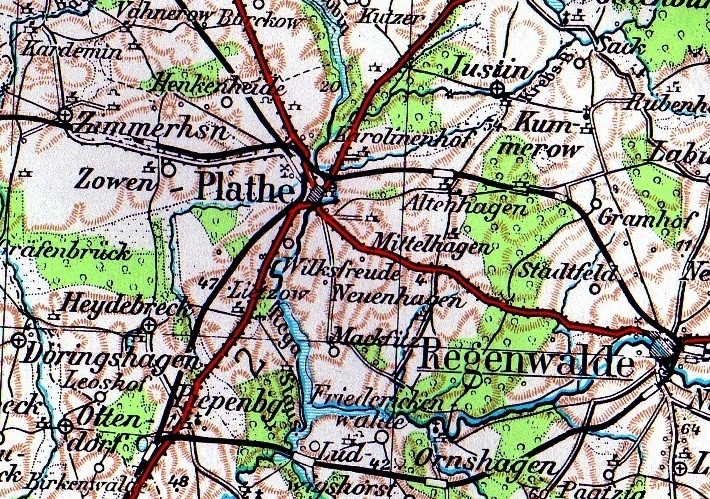 This is one possible Kreis [county] in Pommern [Pomerania, Prussia] where my Krueger family might have come from. My grandfather Lloyd Krueger thought the Kruegers came from Regenwalde. I’m not sure why he thought that. I’m just making note of the records available online here: FamilySearch.org link for Kreis Regenwalde. Evangelische Kirche Bandekow: Loppnow & Schmalenthin – [1825-1874; 728 pages] Spot Checked – Krueger records found. Evangelische Kirche Labes – [1824-1864; 606 pages] – Spot Checked – Krueger records found. Evangelische Kirche Plathe – [1820-1874 in five volumes. 1847 seems omitted. Includes Piepenburg, Heidebreck, Leoshof, & Karant] – Krueger records found, Kamrath records found, Hoge records found. Evangelische Kirche Plathe: Heidebreck – [1825-1837; 67 pages] – Spot checked. – Krueger records found, Hoge records found. Evangelische Kirche Plathe: Neuenhagen, Lietzow, Mackfitz, Mittelhagen, Altenhagen – [1825-1843; 110 pages] – Spot Checked – Krueger records found. Evangelische Kirche Teschendorf: Vehlingsdorf – [1819-1874; 296 pages] – Spot Checked – Krueger records found, Pribbernow records found. Evangelische Kirche Witzmitz: Natelfitz & Stölitz – [1824-1870; 346 pages] – Spot Checked. Evangelische Kirche Woldenburg – [1824-1874; 564 pages, includes Justin, Wisbu, Rottnow, Muddelmow] – Spot Checked – Krueger records found. Evangelische Kirche Woldenburg: Wisbu, Rottnow – [1825-1855; 173 pages] – Spot Checked – Krueger records found, Hoge records found. I’m putting up the Kamrath family records as I process them. There are typos and things I can’t read because I don’t speak German, so these entries just contain the basic information. You should refer to the original records to extract more detail from them (e.g. occupations, times of birth, causes of death). Marie Louise & Hanna Ottilie, daughters of Dorothea Maria Kamradt [No father indicated], born 27 Aug, baptized 31 Aug 1824. Godparents: Anna Sophia Haamann née Kamradt, Wilhelmine Haegen, Friedrich Häefert. Henriette Caroline Christiane, daughter of Johann Haamann & Anna Sophie Kammradt, b 23 Jul, baptized 7 Sept. Godparents: ?? Kuloff, ? ?, Loife. Hanna Loise Maria Ottilie Kamradt, [No parents indicated], born 8 Feb, baptized 10 Feb. Marriage of Christoff Zobel & Dorothea Kamradt, 20 Sept 1827. Carl Friedrich son of David Backhauf Dorothea Kamradt, b 19 Oct, baptized 21 Oct, Godparents: Johann Hamann, Carl Backhauf, Louise Harph of Mackwitz near Platke. Anna Sophie, daughter of Christoph Zobel & Dorothea Kameradt, b 19 Nov, baptized 30 Nov. Godparents: Frau Zobel née Liermann, Frau Kahn née Esther Magedans, David Zobel. Wilhelm Friedrich, son of Johann Haamann & Anna Sophia Kamradt, born 28 Mar, baptized 19 Apr. Godparents: Gottlieb Liermann, Johann David Haamann, Anna Sophie Rusch. Hannah Wilhelmine Louise, daughter of Johann Hahmann & Anna Sophie Kamradt, born 16 Aug (no baptism date given), Godparents: Wilhelmine Kamrath, Louise Kamrath of Wittenfelde, David Zobel. August Friedrich Wilhelm, son of Michael Kamrath and Louise Bremer, b 2 Oct, baptized 24 Oct, Godparents: Wilhelm Bauers, Wilhelm Schultz of Malfoco, Wilhelmine Rusch. Mittman Kamrath died 25 December, aged 63 years, buried 28th December. Carl Friedrich August Westphal, son of Carl Westphal, Kolonist in Mussow, and Anne Sophie Kamrath, born 30 Oct, baptized 11 Nov, Godparents: Christoph Zobel, Wilhelm Kahn, Charlotte Leitzke. 5 March marriage of Carl Westphal with Anna Sophia Kamrath. Friedericke Caroline WIlhelmine Tugendreich, daughter of Ludwig Christophe Zobel and Dorothea Maria Kamradt, born 14 Dec, baptized 4 Jan 1835. Godparents: WIlhelmine Zobel, Ernst Zobel, Carl Zobel. Christine Wilhelmine Friedericke, daughter of Carl Westphal and Anna Sophie Kamradt, born 19 Dec, baptized 19 Dec., Godparents: Anna Maria Rackow Liermann, Wilhelmine Kamradt, Ernst Rackow. Carl Friedrich Wilhelm, son of Friedrich Wilhelm Bauers & Anna Sophia Spanekow, born 13 Dec, baptized 8 Feb, Godparents: Carl Friedrich Kamrath of Falkenberg, Friederich Bremer, Carl Friedrich Wilhelm Burf. Hanna Sophie Friedericke Tugendereich, daughter of the laborer Carl Westphal and Anna Sophia Kammradt, born 19 May, baptized 12 Jun, Godparents: Johann Friedrich Kamradt of Falkenberg, Ernst Friedrich Oesterrich of Hermelsdorf, Esther Maria Maudanz, Erdmuth Friedricke Tugendreich Kamradt of Wittenfelde, Dorothea Louise Friedricke Kamrath of Wittenfelde. Johann Wilhelm Friedrich, son of Johann Friedrich Wilhelm Bauers & Wilhelmine Rusch, born 14 Oct, baptized 11 Nov, Godparents: Friedrich Leitzke, Ernst Kamrath, son of Michael Kamrath of Schoenwalde, Marcia Krüger, of Schoenwalde, Anna Sophia Rusch of Schoenwalde. Marie Ernestine Charlotte, daughter of Carl Westphal, laborer and Anne Sophie Kamrath, born 16 Jul, baptized 11 Aug. Godparents: Dorothea Marie Westphal, wife of Ernst Rackow. Anne Sophie Wilhelmine Liermann, daughter of Gottlieb Liermann. Carl Friedrich Ernest Kamrath, son off Michael Kamrath of Schoenwalde. Wilhelm Friedrich, son of Johann David Wilhelm Knaack & Dorothea Louise Friedericke Wilhelmine Kamrath, born 8th Aug, baptized ?? Aug. Godparents: Davod Kobel, the laborer Carl Westphal, Dorothea Louise Bremer, wife of Michael Kamrath. 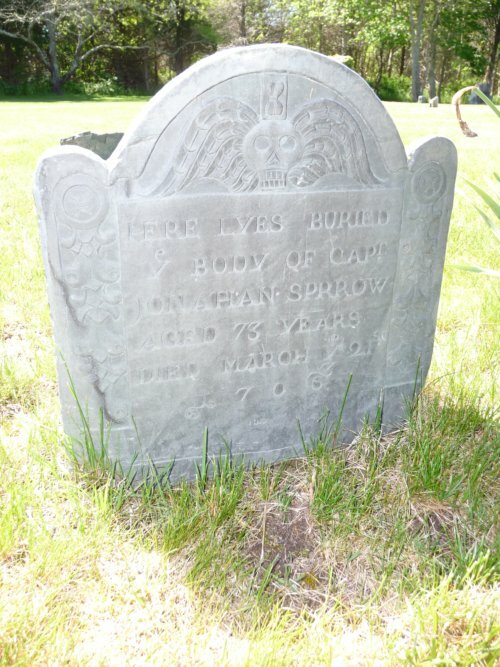 Death of Marie Ernestine Charlotte Westphal, daughter of the laborer Carl Westphal. 1 month, 4 days, died 24 Aug. Marriage of Johann Gottlieb Schultz, son of Carl Schultz of Megow, 30 year old, to Albertine Wilhelmine Friedericke Tagendreich Kammrath, 19 years old, daughter? of Michael Kammrath, on 22 July. Ernest Kamrath, son of Michael Kamrath (farmer?) listed as godparent to Ernst Friedrich Wilhelm Kobel. Louise Ultrine Ernestine, daughter of Ernst Kamrath & Marie Wilhelmine Maass, born 21 Apr, baptized 13 May. Godparents: Wilhelmine Schulz, wife of Matthias Maatz, Wilhelmine Kamrath, wife of Johann Schultz of Meesow. Friedericke Maass, wife of Johann Kamrath of Walsleben. Charlotte Tiebelkaw, wife of Winter from Massow. Christoph Schulz of Walsleben, Friederich Maasss of Walsleben, August Zobel son of David Sobel. Herman Otto, son of Ernst Kammrath & Marie Wilhelmine Maass, born 26 Aug, baptized 5 Sept. Godparents: Friedrich Brehmer, Carl Westphal, Auguste Bauers, Wilhelm Bauers. Michael Kammrath, aged 67 years 4 months 25 days [born 28 Oct 1782], died on 25 March, buried on 28 March. Dorothea Louise Brehmer, wife of Michael Kammrath, aged 62 years [b 1790], died 19 Feb, buried 22 Feb. Lists number of children. Ernestine Wilhelmine, daughter of Ernst Kammrath & Marie Wilhelmine Maass, born 8 Dec, baptized 18 Dec. Godparents: Wilhelmine Hamann, wife of Radantz from Stramehl, Friederike Zobel, wife of David Zobel, August Kammrath, son of Michael Kammrath. Louise Albertine, daughter of Ernst Kammrath and Marie Wilhelmine Maass, born 13 Dec, baptized 22 Dec, Godparents: Carl Nöletke, M Degner née Friederike Buss. Henriette Gartzke, Wilhelm Gartzke. Death of Maria Wilhelmine Maaas, wife of Ernst Kammrath, 28 years, 3 months [b Jul 1829], died 6 Oct, buried 9 Oct. Husband and four children survive. Death of Louise Albertine Kammrath, daughter of Ernst Kammrath, 1 year 10 months, 8 days of age. Died 21 Oct, buried 24 Oct.
Johann Gottliebe Kammrad [Kamrath], from Franzfelde, son of Michael Kammrad, age 25 [b 1833], to Wilhelmine Augustine Henriette Schwanebek, age 25, daughter of Johann Schwanebek. Married 21 October. Bertha Ernestine Wilhelmine, daughter of Johann Gottlieb Kammrath & Wilhelmine Schwanebek, born 4 Sept, baptized 16 Sept. Godparents: Wilhelmine Rusch, wife of Wilhelm Bausers. Alvin Küther, wife of Brehmer. Carl Dünow, son of Carl Dünow. Albert Friedrich Julius, son of Ernst Kammrath and Auguste Vergin, born 11 Dec, pabtized ?? 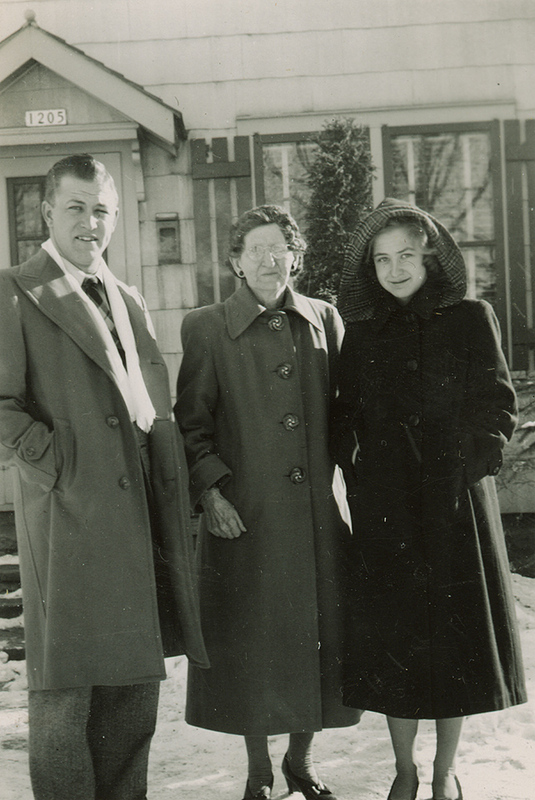 Dec. Godparents: Friedrich Vergin, David Zobel, Alwine Küther, wife of Brehmer. Ernestine Wilhelmine Friederike, daughter of Gottfried Kammrath & Wilhelmine Rakow, born 26 Dec, baptized 27 Dec. Godparents: Sophie Westphal, Henriette Rakow, August Rakow. Christian Friedrich Gottfried Kammrath, son of Johann Friedrich Kammrath of Massow, age 23 [b 1836] and Ernestine Wilhelmine Friederike Rakow, age 24 [b 1835], daughter of Ernst Rakow, married the 7th February. Ernestine Wilhelmine Friederike Kammrath, daughter of Gottfried Kammrath, age 5 days, died 31 December, buried 2nd January. August Johann Friedrich, son of Gottfried Kammrath and Wilhelmine Rakow, born 15 Feb, baptized 2? 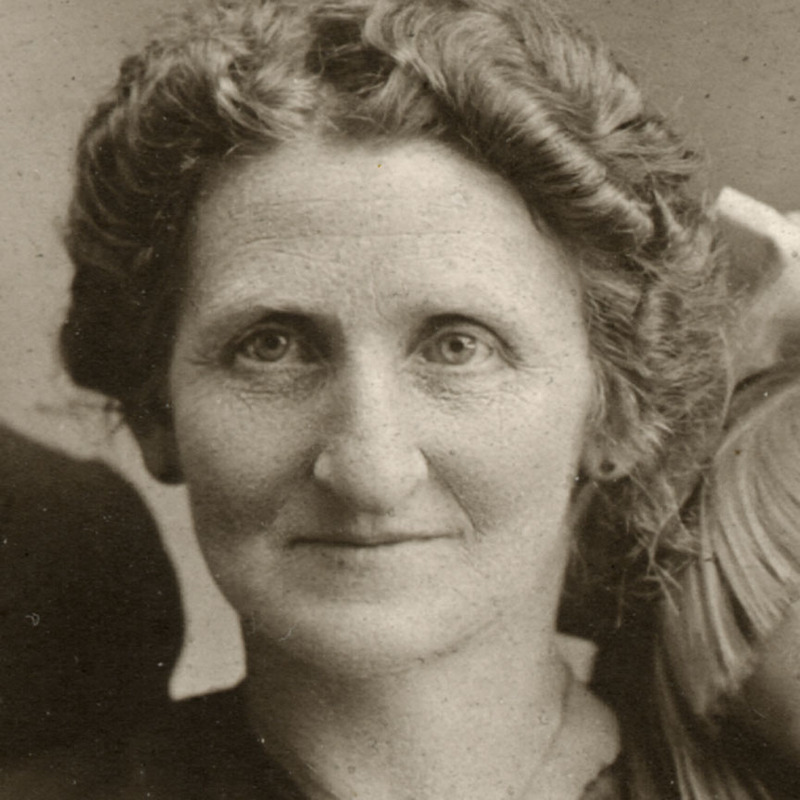 Feb, Godparents: August Westphal, Johann Reinke, Helen Hassel, wife of Ernst Buss of Schoenwalde. Bertha Auguste Maria, daughter of Johann Gottlieb Kamrad and Wilhelmine Schwanebek, born 15 Apr, baptized 30 Apr. Godparents: Friedrich Bauers, Henriette Rusch, Wilhelmine Kanatz, Johann Schulz. Ernst Friedrich, son of Ernst Kammrath and Auguste Wilhelmine Vergin, born 5 Jul, baptized 14 Jul, Godparents: Carl Nötelke, Wilhelm Manks of Falkenberg, Johann Schulz of Meesow, Emilie Haass of Voightshagen, Mathilde Kammrath daughter of Johann Kamrath of Walsleben. Bertha Auguste Maria Kammrath, daughter of Gottlieb Kammrath, died at 26 days of age on 11 May. Buried on 14 May. Hanne Auguste Marie Kamrad, daughter of Gottlieb Kamrad, died at age 1 month 11 days on 5 Oct, buried 7 Oct.
Albert August, son of Gottlieb Kamrad & Wilhelmine Schwanebek, born 10 Oct, baptized 1 Nov. Godparents: Johann Schulz, Carl Brechler, Wilhelmine Dünow, wife of Friedrich Bauers. Bertha Wilhelmine Louise, daughter of Gottfried Kamrath & Wilhelmine Rakow, born 13 Nov, baptized 6 Dec. Godparents: Johann Kamrath of Massow, Helene Rakow of Pagenkopf, Johanne Korth of Dorotheenhof. Hermann August, son of Gottlieb Kamrad & Wilhelmine Schwanebek, born 2 Oct, baptized 15 Oct. Godparents: Albert Kamrad (Miller/Müller) of Langkafel, Frank Bauers, Louise Radke wife of Johann Schalow. Ernestine Johanna Friedrike, daughter of Gottfried Kammrath & Wilhelmine Rakow, born 27 May, baptized 10 Jun. Godparents: Louise Maudanz, Friedrike Rakow, Wilhelm Hamann. Albert Hermann August, son of Gottlieb Kamrad & Wilhelmine Schwanebeck, born 18 Nov, baptized 1 Dec, Godparents: August Dünow, Herman Schulz, Henriette Grunewalt, daughter of Johann Grunewaldtt of Rossow. Albert August Kamrad, son of Gottlieb Kamrad, age 3 years, 6 mos, 12 days, died 23rd Apr, buried 26 Apr. Dorothea Kamrath, wife of Christoph Zobel, aged 76 years [b 1791] died 16 Aug, buried 20 Aug.
Bertha Ernestine Wilhelmine Kamrad, daughter of Gottlieb Kamrad, aged 9 years 23 days, died 27 Sept, buried 1 Oct.
Hermann August Kamrad, son of Gottlieb Kamrad, aged 12 years 11 months, 28 days, died 30 Sept, buried 3 Oct.
August Herman Friedrich, son of Gottlieb Kamrad & Wilhelmine Schwanebeck, born 14 Jan, baptized 6 Feb. Godparents: Ernst Kell, Schönbeck, Friedrich Lienstadt of Brannsberg, Luise Zibell, of Bweringen. Wilhelm August Friedrich Kamrath, son of Gottlieb Kamrath & Wilhelmine née Schwanebeck born 19 Jan, baptized 26 Jan. Godparents: Wilhelm Stark, Carl Banners, Wilhelmine Ahlmann née Schultz. Unnamed stillborn child, born 20 Jan to Gottlieb Kamrath & Wilhelmine Schwanebeck. Stillborn daughter of farmer Gottlieb Kammrath, died 20th Jan. No burial indicated. Wilhelm August Friedrich, son of Gottlieb Kamrath aged 3 months, 26 days died 15th May, buried 17th May. The Eigenthümer Carl Friedrich Eduard Kamrath, son of Michael Kamrath from Franzfelde, age 32, with Wilhelmine Ernestine Henriette Banners, age 22, daughter of Wilhelm Banners were married 7th November. August Wilhelm Friedrich, son of Gottlieb Kamrath & Wilhelmine née Schwanebeck, born 24 Jul, baptized 10 Aug. Godparents: August Kammarath, Franzfelde, Julius Hermann Klüth of Burrow, Sihalow? Caroline Pauline Katharina & Dorothea Maria Elisabeth, daughters of Theodor Kamrath & Gertrud Blankenburg, born 29th May, baptized 15th Jun. Godparents: ? von Blnkenburg from Kussow, Max Blankenburg from Kussow, Anna von Blankenburg from Kussow, ?? Kamrath from Neu Stettin, ?? Lihnmann from Darz, ?? von Vlankenburg from Zimmerhausen, Frau von deer Osten, Plathe, Frau ?? Wilde from Dargitz. This is a list of church records available from Kreis Naugard, which is very likely the kreis where my Kamrath relatives came from. It will be a huge amount of work to go through these records one page at a time, but it’s probably the only way we will know where my specific Kamrath family lived prior to coming to America. 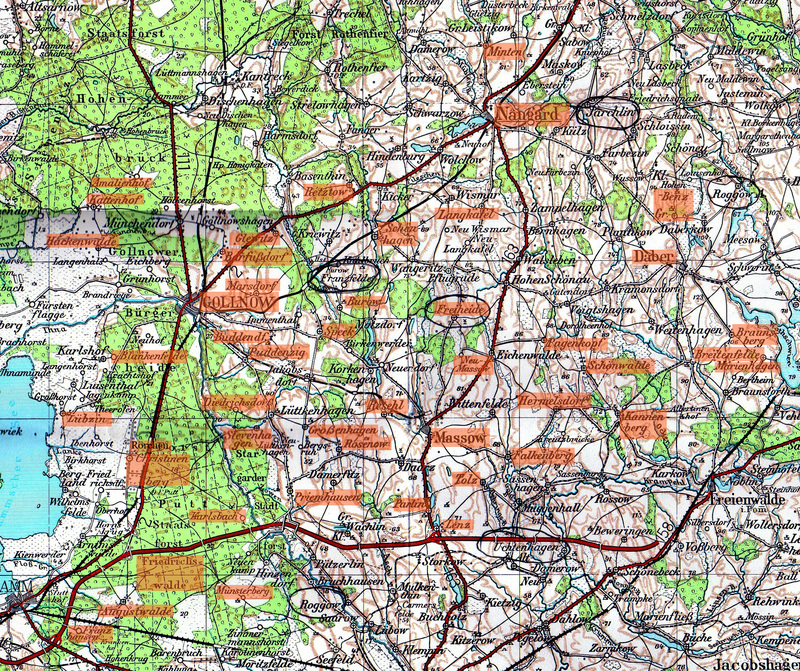 See below for a map of Prussia showing these parishes. Evangelische Kirche Naugard: Naugard – [1795-1819, 287 pages] – Too early to spot check.